I would find it very hard to imagine a more talented Free Agent class than the one we have here in 2012. With the likes of Peyton Manning, defensive stud Mario Williams, and a handful of some of the best wideouts that the NFL has to offer, there is a complete frenzy to get players signed and ready for next season. Peyton Manning can very well be the most coveted Free Agent in NFL history. Jeff Darlington of the NFL Network reported that Thursday morning Peyton contacted the Miami Dolphins, the supposed front runners to get him, telling them that he was not going to play for them. This leaves Miami looking at their second Quarterback option, the very talented backup to Aaron Rodgers, Matt Flynn. 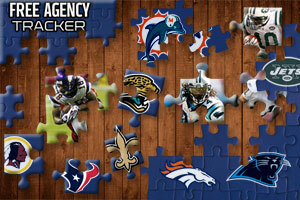 As for Peyton, there are only three teams left that he is giving consideration to for his future destination. The front runner seems to be the Denver Broncos where “Tebowmania” took over last season. The Tennessee Titans also have a good chance to have Peyton sign with them since he has a close relationship with the state being a former Quarterback Heisman Trophy winner for the University of Tennessee. The final team in the running are the Arizona Cardinals, but with Kevin Kolb owed money and Peyton not ready to make a decision at this time, the idea of him going to Arizona is becoming slimmer. Arizona does have one great main attraction though in Larry Fitzgerald, so we will all wait in anticipation to see where Peyton goes. To me, the next best Free Agent of the offseason would be former first pick of the draft, Mario Williams. Being a Jets, I was very disappointed to hear that he had signed to one of my AFC East rivals, the Buffalo Bills. It makes sense that the Bills would target arguably the best pass rusher in the NFL, based on the fact that they had absolutely no pass rush last season. The question still remains wether or not the Bills paid too much or invested too much in a player that has proven to be injury-prone throughout his career. The forever disappointing Buffalo Bills have signed Mario Williams for 6 years, $100 million dollar contract with $50 million guaranteed. If Williams stays healthy, this can end up being a great signing for the lowly Bills. I hope he doesn’t…sorry Bills fans! It seems like every other Free Agent this season is a Wide Receiver. With names like Mike Wallace, Vincent Jackson, Pierre Garcon, Reggie Wayne, Robert Meachem, Eddie Royal, Laurent Robinson, Dwayne Bowe, Wes Welker and DeSean Jackson it very hard to pick a #1 Free Agent Wideout. A handful of the names I have just mentioned have already been signed in the past week but tons more are still waiting for the right fit. The young and acrobatic, Jerome Simpson, the “oops I shot myself” Plaxico Burress and the Salsa dancing Hines Ward are all available and possible choices for a team to turn an average receiving core into a prolific one. The best available WR at the end of the season in my eyes was Marques Colston. He ended up re-signing with the Saints, but who wouldn’t if you had Drew Brees throwing strikes to you all day. As a Jets fan, I would love it if they didn’t go for headlines and looked for heart and skill. Maybe we should look at old Jets players that were good fits for us and didn’t cause problems that are now available again (i.e. Jerricho Cotchery). Let us know who you think needs to make changes to their team and who might be a good fit for your team. Also, feel free to let us know what you think of the signings and changes already made this season. Feel free to DEBATE!!! This entry was posted on March 16, 2012 by MatthewToddErich. It was filed under Football . Flynn just signed with the Seahawks making the future for Miami Dolphins look pretty bad considering their top two choices decided to go elsewhere. There are talks that Alex Smith is talking to Miami. As a Jets fan I say let them have him because Alex Smith has had only one average season and that was with the best defense in the league. I love seeing the Miami Dolphins suffer. The Bills getting Williams was a two-old situation. DESPERATELY needed a top notch pass rusher, but also needed to show the rest of the league that they are serious about bringing top FA’s and players to the team. Part two was a success, now we just need Mario to play like the stud DE he is and this team will be taking a big jump forward. Also, everyone here in WNY thanks the Jets for resigning Sanchez. As a Jets fan I’m happy that they’re not making the obvious big moves and focusing instead on fixing the mess that is now the Safety position. Hopefully they can have someone like Reggie Nelson signed over the weekend, maybe Landry too. That would keep them from reaching for Barron in the first round and focus on the best player available. If they can swing that and pick up a replacement for Wayne the turnstile Hunter then this will be a good offseason. If not then its time to look for a bandwagon to jump on. Maybe the Bills. At least they now have a pass rush. The Bills pulling the trigger on Williams was by far the best signing recently. I think the Jets should bring in Hines Ward for a one or two year deal. He won’t be as prolific as he used to be due to his age but I think that the locker room needs that sort of mature veteran player to settle things (Santonio) down a little. Maybe he’ll run some sort of salsa ice breaker in camp. I think you have to overpay for a 27 year old top 5 pass rusher. These guys rarely become free agents. If my team finally gets Tom Brady and the Patriots to finally game plan around someone, I’d pay the whole cap. The Bills are still 14 million under the cap AFTER the deal so I think it was the right decision. Kyle and Mario Williams + Alabama stud Marcell Dareus is a formidable front. Mario Williams is an absolute beast. I think the Bills made a great move to bring him in. Putting him in the line-up with a (healthy) Kyle Williams and Dareus absolutely scares me as a Jet fan. Williams has had a couple of injuries in the past two years, but in his first 4 seasons, he played all 16. I was hoping the Jets would make a serious move for him, as we have no pass rush at all outside Aaron Maybin, a free agent pick-up from last year. I can already see Sanchez pulling the dirt out of his facemask, as Williams strip sacks him. I think those two wins the Jets always pencil in against the Bills might not be as easy to get anymore. the over saturation of free agent wideouts will keep the contract values down, as well they should be. these guys are for the most part notorious for having one or two good years, and trying to cash in thinking they’ve actually had a career. then they quickly fizzle out, but still want superstar money and status. (i.e., P. Burros, Ochocinco, B. Edwards, S. Holmes, and a throwback example, K. Johnson) not a hall of famer in this bunch. you want a hall of fame wideout career, see Jerry Rice, Steve Largent, Fred Belitnikoff. I agree that none of the WR’s in this free agent class are outstanding, hall of famer caliber players. However, not sure what the need of throwing Holmes name out there, he’s not a free agent. There is also a significant amount of Jets in your point, actually every player on your list was a Jet except for Ochocinco. I think a much better example of a WR in this class who perfectly fits your description is Mario Manningham. He had a HUGE catch in the Super Bowl, but anyone who has watched him for the past few years knows he drops that ball, and all balls more often than not. He would have got paid a lot based on that one catch but because of the huge numbers of FA’s, he won’t get nearly as much. However, the team that gets him for less will be thankful that is the case, because he definitely would have been grossly overpaid.